6-2 College Football and 2-0 NFL for 1 Unit Plays!!! 4-1 to begin the Hilton Supercontest!!! A great start to the football season going 6-2 after week 2 of College football and 2-0 after the first week of the NFL. In addition off to a fast start in the Hilton Supercontest going 4-1 the first week. In the NFL We won with Denver Thursday night and last night we had San Fran +3-115 which was an easy 28-0 winner. Yesterday in MLB we had two 1 unit plays and both lost. Tampa Bay +156 lost 2-3 and St Louis +128 lost 1-4. 3 of the 5 moved our way, 1 against and the other stayed close. Today so far I have sent out 2 one unit plays and 5 Big move games. Let me ask? Would it help you to know in advance which way the line was going to move:) If it would then it’s not too late to get the rest of the big move games through the last game of the world series. I send these out first thing in the morning so you have plenty of time to plan your strategy. 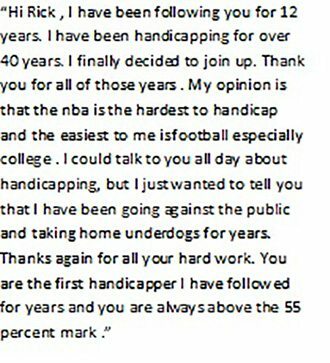 Saying that there is plenty of time to take advantage of what typically is the best time of the year for my handicapping. Consistently the NFL and College football have been very strong year after year with drawdowns small. Take a look at the subscription options under the PayPal menu and take your choice! All have a 3-day free trial. 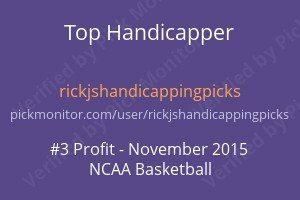 3-0 on Monday ….2-0 MLB and 1-0 WNBACollege Football, MLB, NFL, TESTIMONIALS!! !